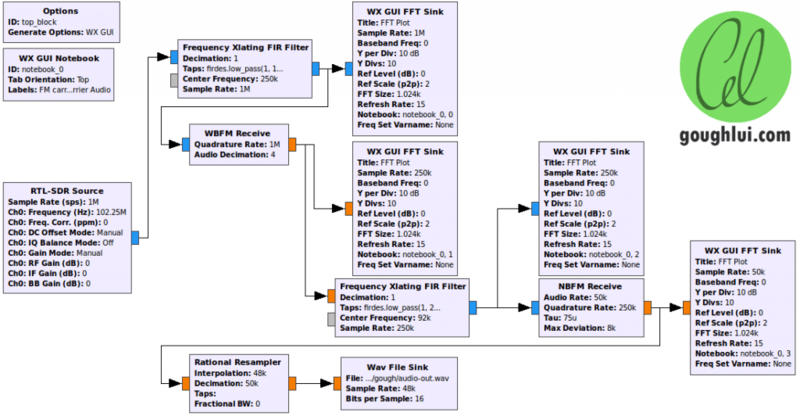 Over on GitHub user jj1bdx has just released a new tool called rtl_power-fm-multipath which can be used for estimating broadcast FM multipath distortion with an RTL-SDR. Broadcast FM multipath is caused when a signal is received from multiple directions due to it reflecting off and refracting through physical objects like buildings and terrain. As the reflected/refracted signals will be delayed it can cause echo like distortions in the RF signal which can cause issues like poor digital decoding, poor FM audio reception and ghosting in analogue video. The rtl_power-fm-multipath program is based on rtl_power and works by using rtl_power to record power measurements for 5 minutes, then sending the data to a peakhold function which computes the maximum power value for each frequency, and then calculations the distortion ratio. LabView is a popular visual programming environment often used in industry and by engineers for test, automation and control applications. It is somewhat similar to GNU Radio in that programming is done by connecting a series of various blocks together, each of which performs some function. The RTL-SDR is compatible with LabView via a simple RTL-SDR interface. 1. The signal is received from the rtl-sdr device as IQ data. This is converted to a complex signal and the phase is extraced. 2. The phase correction removes phase discontinuities. 3. The key demodulation component in the chain is the phase derivative. The phase derivative takes the phase of the signal and creates a second signal that is composed only of the changes in frequency. This is then the demodulated signal. 4. The low pass filter is used to filter out frequencies above 15kHz, which do not contain the desired information. 5. The rational resample takes the signal, which is still at the sampled rate (in the examples case 286650Hz) and resamples it to something the sound card can handle. In this case, we are using a decimation factor of 13, which results in a 22050Hz audio stream. Actually, I worked this out the other way around. I wanted a 22050Hz audio stream and checked which sample rate would give me an integer decimation while keeping the RF sampling rate as low as possible. In this video I am presenting Airspy+SDR# vs SDRplay+SDRuno in the real world, receiving very weak FM broadcast station in the terrible conditions, with very strong signals around. The Weak signal was in the lower edge of the FM broadcast spectrum, with very strong local signals close to the weak one, in the upper frequencies of the FM broadcast spectrum. The antenna for the both SDR receivers was the same – Vertical Dipole for FM BC band. 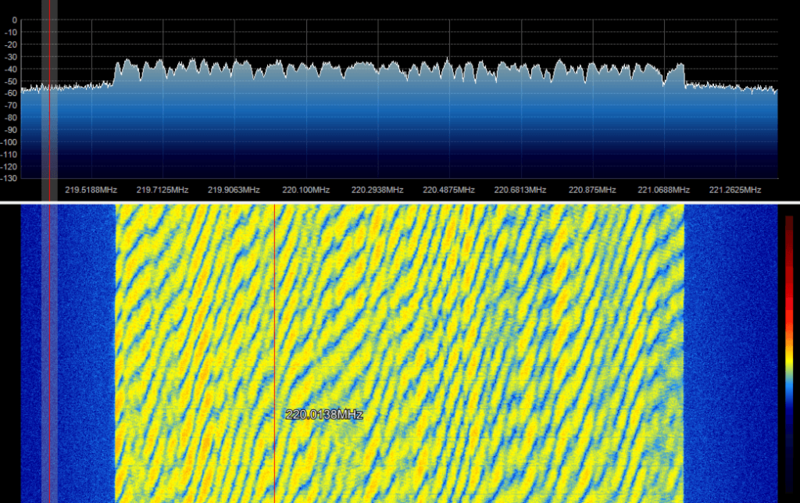 Both SDR receivers were tuned to maximum possible signal to noise ratio (SNR) of the weak FM broadcast signal. In SDRuno RSP control panel (for SDRplay receiver) ZERO IF and 0.3/0.6 bandwidth were chosen, and the weak signal of interest was placed on the right edge of IF filter, so that the strong signals from other FM broadcast radio stations were placed right from the weak one in order to minimized the negative influence to the our weak signal. LNA was switched off. When the LNA was on, there where high distortion level because LNA was overloaded from the strong signals, and SNR was deteriorated regardless of gain reduction. The best results were achieved with gain reduction set to “0”, without LNA. In SDR# software (for Airspy SDR receiver) 10 MSPS and Decimation was used. From the version 1480, in SDR#, when decimation is choosed, there is tracking filter which allow better selectivity, so you can use more gain, increasing the SNR to maximum possible level depending of concrete situation. The overall receiving conditions was extremely bad. The signals from local FM radio stations were too strong so the weak signal from this video can not be received at all, with many expensive FM tuners which I tried: Pioneer VSX 527, Denon AVR-1802, Marantz SR6300. I was tried RTL-SDR just for fun, but it can not receive weak signal too :-), not because SDR-RTL is not sensitive enough, but because its dynamic range is not so high and it is overloaded by too strong local signals. The very sensitive receiver is not problem to design and produce. Much more difficult is to design a high dynamic range receiver. which will be able to receive very weak and very strong signals at the same time without overloading. Overloaded receiver front end means that it is not linear any more, and produces many signals by itself, increasing its noise level. Very strong signals at the receiver front end makes Desensitization of the receiver, so it could not receive weak signals any more. In the second video Leif sm5bsz compares the Airspy+SpyVerter with the SDRplay RSP on HF reception. He concludes that the difference between the two radios on HF is small. However, Youssef from Airspy has contested the result, noticing that Leif ran the Airspy at 2.5 MSPS, resulting is significantly less decimation being used. In response Leif updated his video adding an A/B comparison on HF with the Airspy correctly running at 10 MSPS in the last 8 minutes of the video. The results seem to show that the SDRPlay and Airspy+Spyverter have similar HF performance, but when comparing maximum decimation on the Airspy and the smallest bandwidth the SDRplay to obtain similar bandwidth’s, the results seem to show that the Airspy+SpyVerter is about 5 dB more sensitive at receiving weak signals. A new RTL-SDR Radio Receiver app for Chrome has been released. The source code can be viewed at GitHub. The app is currently capable of receiving broadcast FM stations and scanning between them. To run this app you will need to have the Chrome web browser installed or be running a Chromebook laptop. Note that at the moment there seems to be a bug in Windows Chrome that prevents this from working. * Unlimited slots for presets. * Supports the International and Japanese FM bands.